OMEGA Engineering offers pH electrodes with integral preamplifiers for laboratory or industrial applications. These electrodes can interface directly with equipment that accepts a millivolt input signal with a 10 k½ or greater input impedance, such as a data acquisition interface or multimeter. The preamplifier converts the high impedance millivolt signal of the electrode into a low impedance signal, enabling the signal to be run up to 305 m (1000') without signal loss. The electrode is supplied with 1 to 3 m (3 to 10') of coaxial cable, depending on the model. If longer cable lengths are required, simply splice on extension cable. 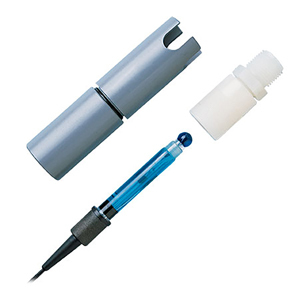 These preamplified electrodes are available in a variety of styles and can interface with any pH meter, controller, transmitter, multimeter or data acquisition system with a one-to-one unity gain. The preamplified power option comes in styles: an encapsulated battery design, suffix "-PB", an external battery style, suffix "-EB", and a style for use with an external dc power source, "-NB". To order a preamplified electrode see the To Order guide below. pH electrode. pH range 0 to 12, temp. 0 to 80°C (32 to 176°F). electrode. pH range 0 to 13, temp. 0 to 100°C (32 to 212). electrode, Kynar housing, 1/2" MNPT threading, insertion length 1". -5 to 100°C. (23 to 212°F). Dimensions: 127 x 25 mm (5 x 1"). 13, temp. range -5 to 100°C (23 to 212°F). Dimensions: 127 x 25 mm (5 x 1"). electrode, CPCV housing, 3/4" MNPT threading, 2" insertion length. -5 to 80°C (23 to 176°F). Dimensions: 168 x 25 mm (6.6 x 1"). gel-filled, pH electrode. Electrode potted in 36" ABS pipe. (32 to 176°F). Dimensions: 28 x 914 mm (1.1 x 36"). 0 to 80°C (32 to 176°F). Dimensions: 28 x 914 mm (1.1 x 36"). Spare battery pack for -EB option. 참고: Comes complete with 1 to 3m (3 to 10') of cable and electrode care instruction sheet. For non-standard cable lengths, replace te suffix "-10" with the desired length in feet; add $2 per foot. (Additional cost of $2 per foot applies to the entire cable length).